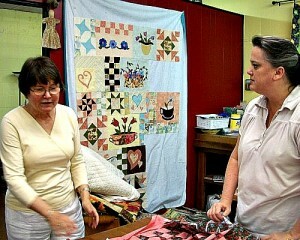 AP depends on the generosity of American quilters to assemble the quilts profiled on these pages. 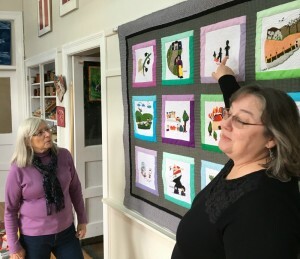 Since 2008, over 45 quilters from seven states (Maryland, Michigan, Indiana, New Jersey, South Carolina, Rhode Island, and New York) have worked on one or more quilts All donated their time for free and showed great skill and commitment. Several of the quilters profiled on these pages have also said that working on quilts has opened their eyes to the challenges facing women in the Global South, and this comes across clearly in videos that we have made on the making of quilts from Bangladesh, Peru, Jordan and the DRC. 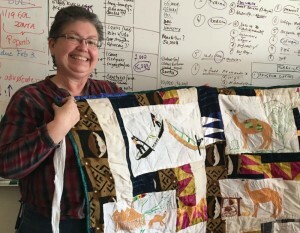 In other words, quilting has helped to build a bridge between these enormously talented quilters in the US and our artists in the Global South. 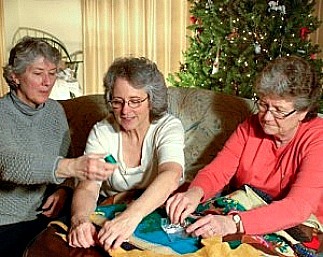 We never anticipated this wonderful outcome. 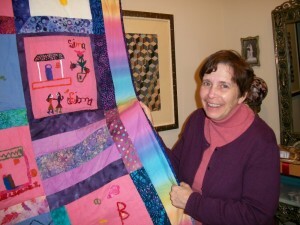 Please contact us to work on a future quilt project. 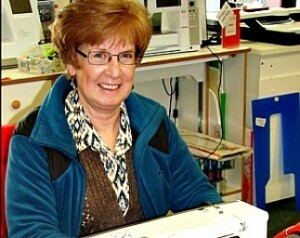 You will be very welcome! 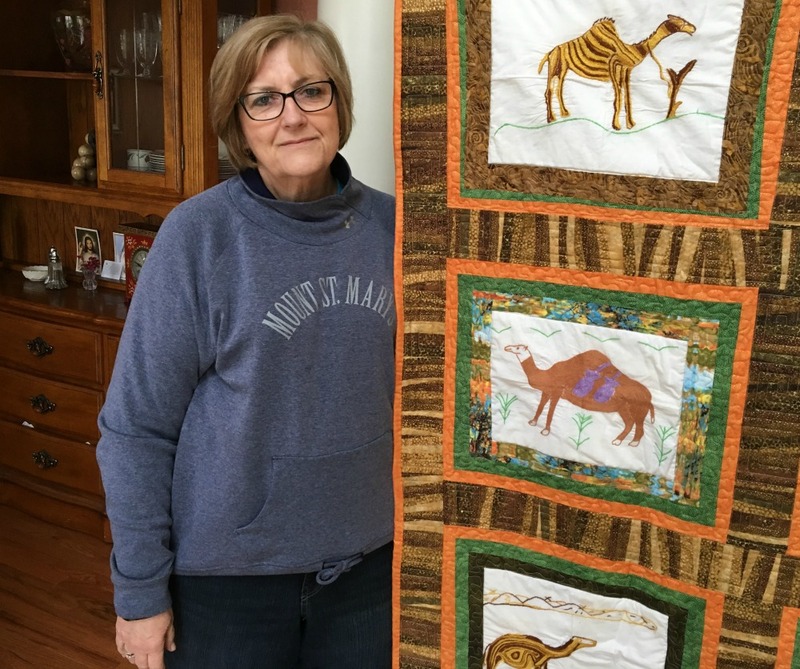 Merry May, from the South Shore Stitchers Guild in New Jersey, assembled the First Mali Camel Quilt from squares that were embroidered by survivors of SGBV in Bamako. 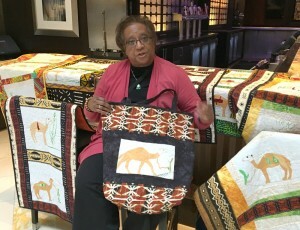 Merry is seen here with the Second Mali Camel Quilt, which was made by the survivors in Mali and modeled on Merry’s own quilt. This quilt now hangs in the Malian embassy in Washington. 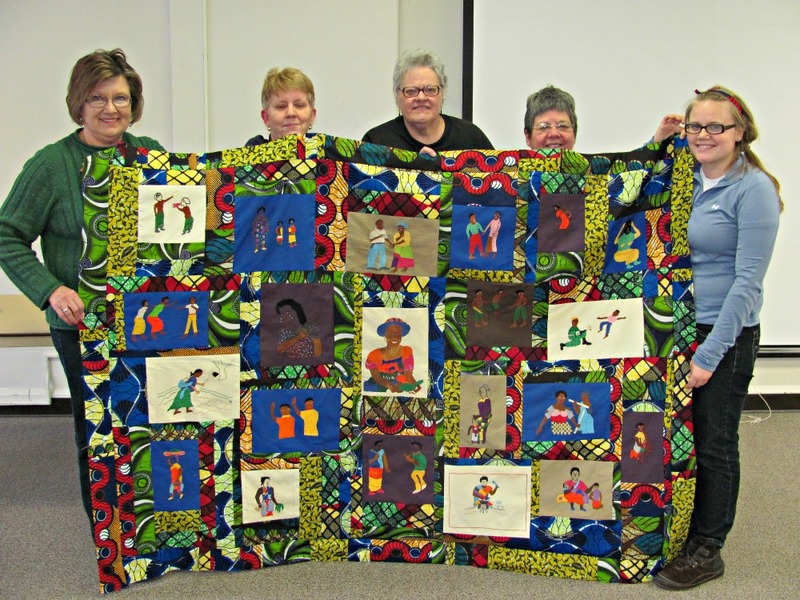 The two Alafia Mali quilts from Mali were assembled by the PM Fiber Arts Guild from Bethesda, Maryland, at the initiative of Helen Blumen, left. 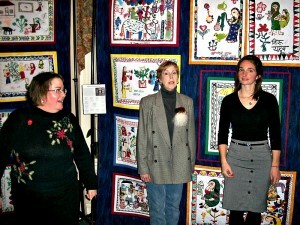 The Nunca Mas quilts from Peru were assembled in New Jersey by Ginny Cooper, Elizabeth Ohlson (shown right), and Merry May from the South Shore Stitchers Guild. 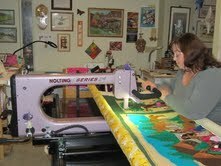 Watch the quilters in action here! 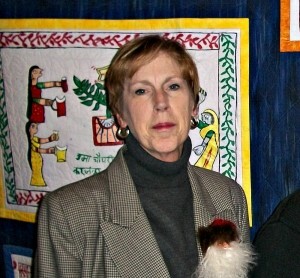 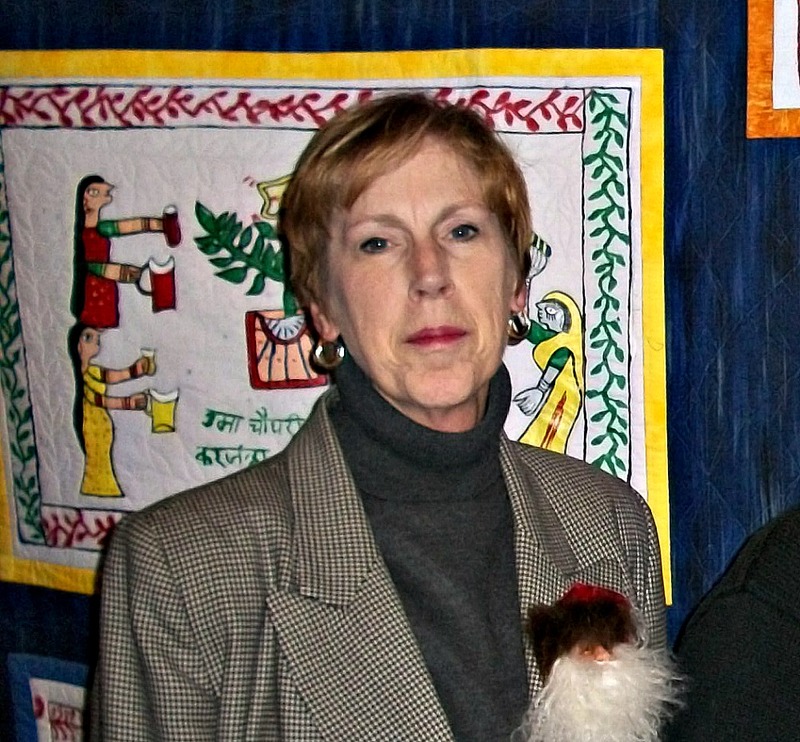 Henna Pride was assembled in Maryland, US, by Nancy Evans (photo) and John Anderson. 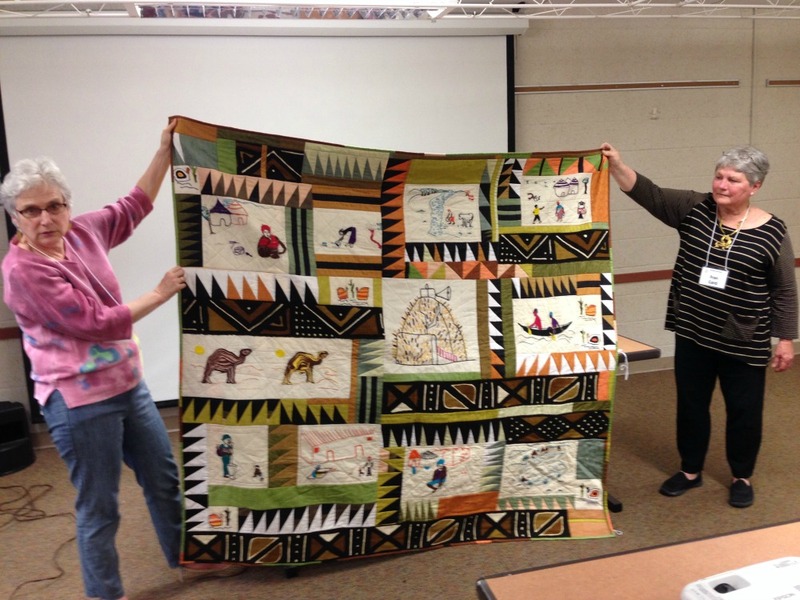 Nancy also helped to assemble the Mahalako Swashta quilts from Nepal (left), the Ahadi quilts from the DRC and the Vietnam Disability Quilt. 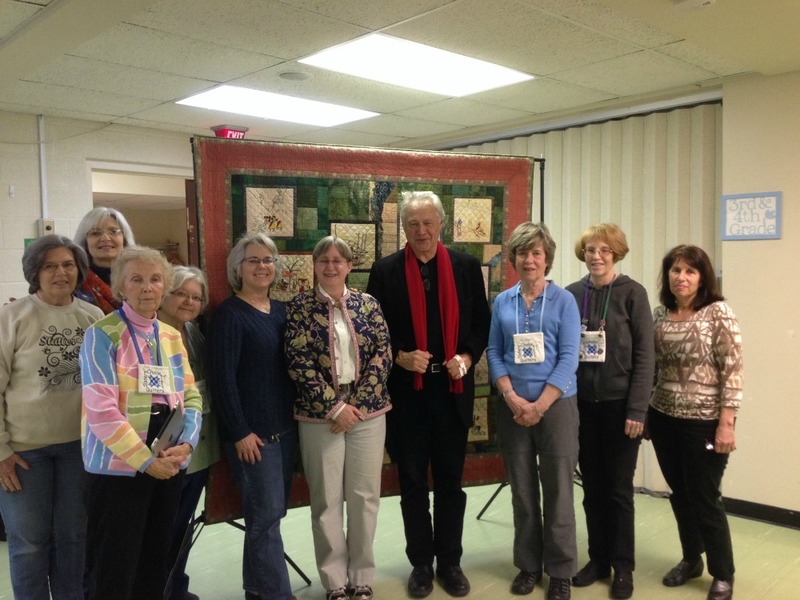 The River Gypsy Quilt from Bangladesh was assembled by The Sisters Choice quilters in Falls Church Virginia, who celebrated the making of the quilt with Iain Guest from AP. Beth Suddaby, sixth from the left, coordinated the quilting project. 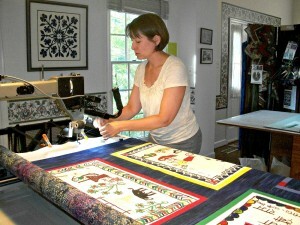 Watch our video on the making of the quilt here. 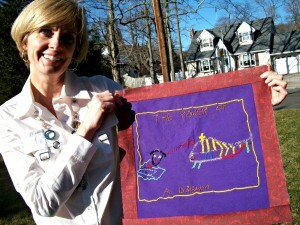 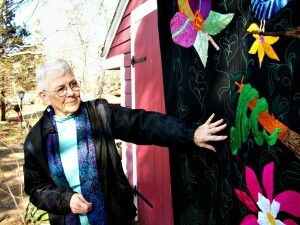 Alison Wilbur, from Rhode Island, is the founder of Quilt for Change. 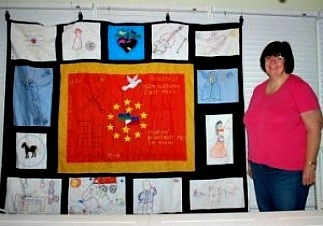 She assembled the Chintan Wastepickers quilt and the Romano Trajo (Roma Life) quilt (left). 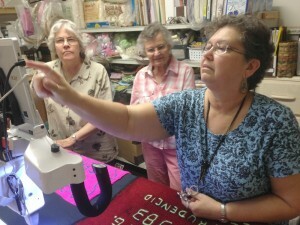 Bobbi Fitzsimmons and Sharon Sisson from the Swan Lake Quilt Guild in Sumter, South Carolina assembled the Gracanica Roma Quilt, and the Child protection quilt. Carol Grimstad assembled the Women’s Microcredit Quilt from panels made by women members of a microcredit cooperative in Bangladesh. 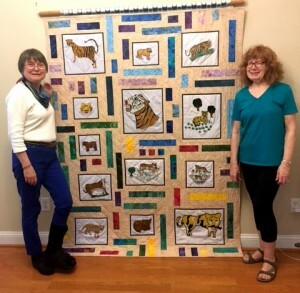 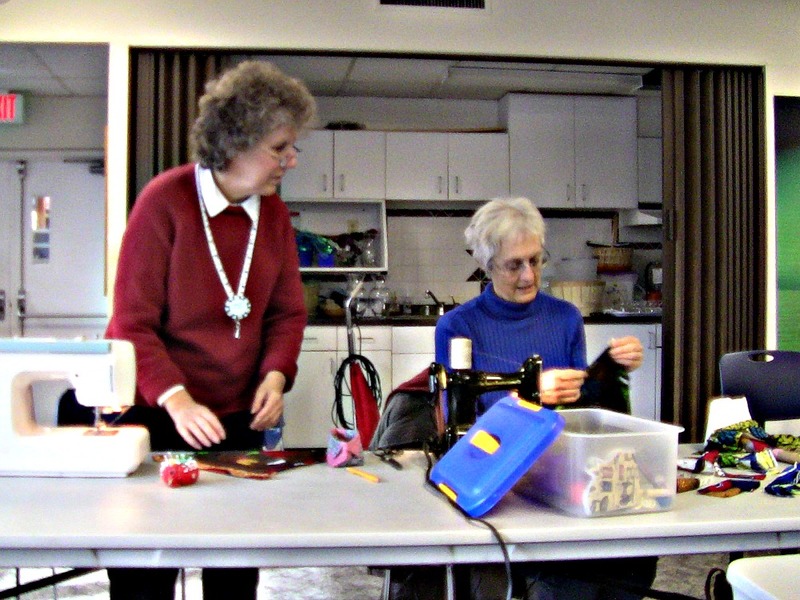 Quilters Nancy Evans (left) and Sharon Rhoton (middle), from Maryland, from the Faithful Circle Quilt Guild, were part of the group that assembled the two Mahalako Swastha quilts from Nepal. 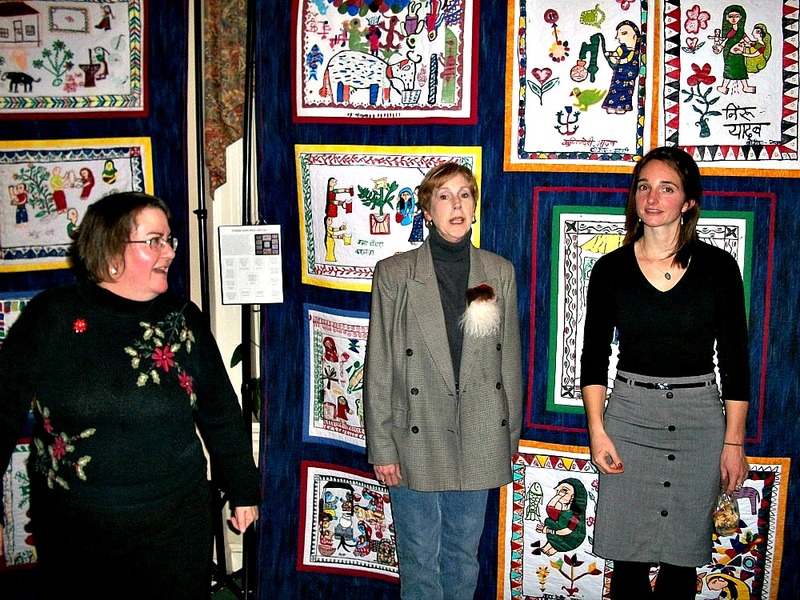 They are pictured with Peace Fellow Kate Bollinger, who worked with the artists in Nepal and brought the painted panels back to the US. 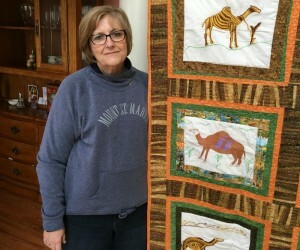 Kathy Springer, from Indianapolis, has assembled three advocacy quilts: the Rehema Widows Quilt from Kenya; the Moroccan Amizigh Quilt; and the Women’s Microcredit Quilt from Bangladesh. Kim, Kelly and Shannon, Rochester, from New York, at work on the first version of the Romano Trajo (Roma Life) quilt from Lithuania. Susan Louis, from New York, compiled the Sixth Love Blanket at her home in New York, from panels made by freed domestic slaves in Nepal. Barbara Wofford, from Maryland, assembled the Czech Roma quilt from panels that were made by Roma women in Mimon, Czech Republic, with help from Barb’s daughter Beth who served as a Peace Fellow in the Czech Republic. 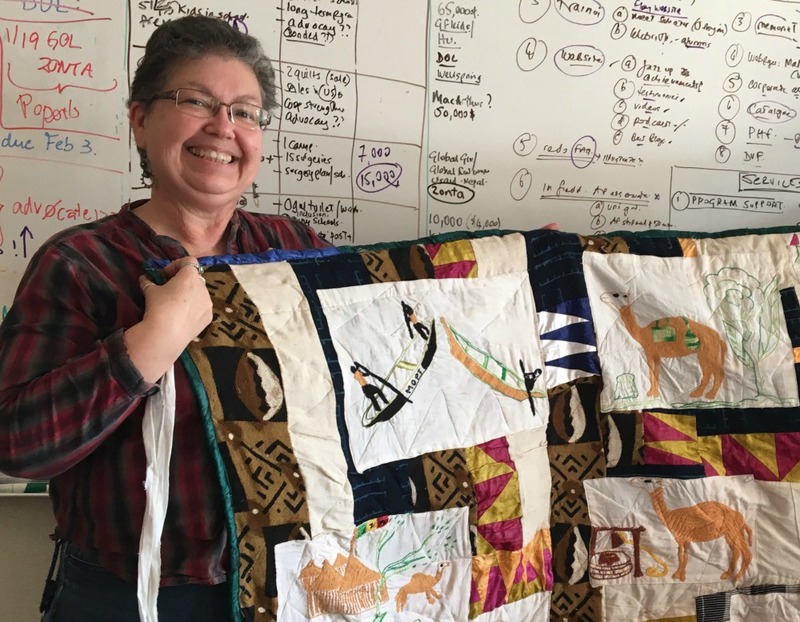 Maria O’Haver, from Maryland, worked on the Mahilako Swastha (Women’s Health) quilts, made by women in Nepal for the Women’s Reproductive Rights Program (WRRP). Onalie Gagliano, from New Jersey, assembled the Maasai Girls quilt from the Kakenya Center for Excellence in Kenya, and the fifth Love Blanket from BASE in Nepal. 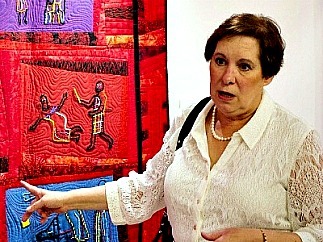 Barbara Barber, from Rhode Island, assembled the Belize Forest Quilt and the Belize Orchid Quilt. 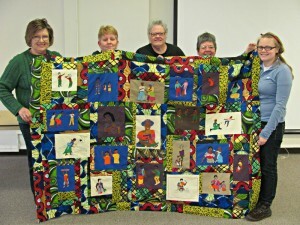 Quilters from the Capitol City Quilt Guild, in Lansing Michigan, with one of the three Ahadi (Congolese) quilts that they assembled in 2011. 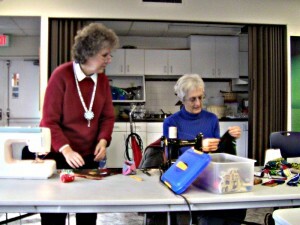 From the left: Barbara Jepson-Taylor, Minda Schneider, Janet Munn, Sue Kesti, and Rosamond Meerdink.